You know how some things sound horrible until you try them? A friend let me try his red chili-infused chocolate bar, for example, and right up until the second I bit into it I was convinced I was about to come out on the wrong end of a dare, and instead I loved it and had to buy my own bar. It works this way with books, too. Most people would consider “cancer novel” the kind of thing to put right back on the shelf as soon as the bookseller who recommended it turns his back. I’m here to tell you I tried it, and by god, I liked it. 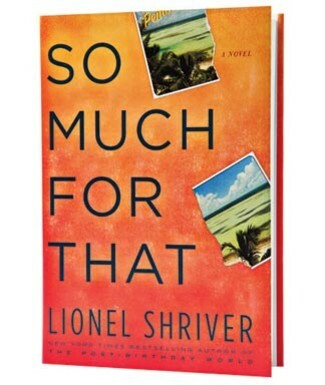 So Much For That is Lionel Shriver’s newest novel, and was a finalist for the National Book Award for fiction this year. I picked it up on a whim and spent the next six months resisting actually reading it after taking a closer look at the premise. Cancer as a subject in fiction generally opens doors for all kinds of maudlin soul-searching and TV-movie family togetherness. It’s a vehicle for all kinds of failed attempts at stirring real emotion, leaving you with that artificial off-flavor. It does not, usually, make you laugh out loud, or make you truly outraged at the world’s injustice, or smile with satisfaction at its resolution. Usually. Shep Knacker is the personification of the Protestant work ethic. Honest, industrious, frugal, Shep turned being an on-call odd-jobs man into a respectable, successful business, Knack of All Trades, which he then sold for a million dollars to an employee who had come into his inheritance. But Shep didn’t just make money for its own sake. Shep has a dream of “The Afterlife,” retiring to a tropical paradise where the cost of living is low and his money will stretch forever. We first meet Shep, who has just quit his job, having worked at his own former business for eight years after selling out, packing after buying three tickets to an island off the coast of Zanzibar, ready to leave alone if he has to but hoping to persuade his wife and teenage son to go with him. Unfortunately, his wife, Glynis, has a secret of her own: mesothelioma, a particularly nasty form of cancer caused by exposure to asbestos – which he might have brought home on his own clothes. Glynis not only worked with metal (or used to); she was metal. Stiff, uncooperative, and inflexible. Hard, refractive, and shiny with defiance. Her body long, attenuated, and angular like the jewelry and flatware she once crafted, in art school Glynis had not chosen her medium by accident. She naturally identified with any material that so fiercely refused to do what you wanted it to do, whose form was resistant to change and responded only to violent manhandling. Metal was obstreperous. Were it ever mistreated its dents and scratches caught the light like kept grudges. So Much For That is a many-layered story. It’s a portrait of a marriage, complete and complex. It’s a meditation on the diminishing reward for hard work, the unfairness of the health care system, and the pernicious influence of so-called positive thinking on our decisions. It is morally ambiguous – there is a great deal of time spent on the roles of what Shep’s best friend Jackson calls “Mugs” and “Mooches”, and what it means to be one or the other, a maker or a taker. It’s full of dark and sometimes sick humor. It also has the most satisfying last line I’ve read in years to cap its well-earned happy ending. It is so well-crafted and so true to life as it is lived today, it is possible that we will look back and consider So Much For That the perfect example of the flavor of our present times.